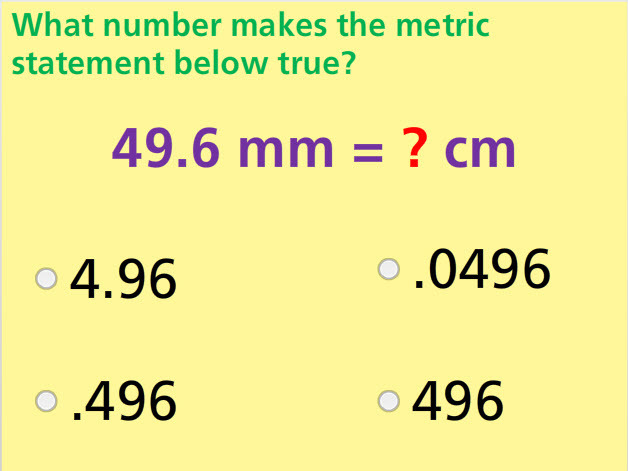 Convert metric units of length, mass, and capacity in this online math test. . Convert centimeters to meters, millimeters to meters, and meters to kilometers. Convert milligrams to grams, grams to kilograms, and milligrams to kilograms. Also, convert milliliters to liters and liters to milliliters. Return from this Convert Metric Units Math Test to the Elementary Math Tests, 5th Grade Math Tests webpage, or to Math Tests.